Each template need these standard tags ! The standard sentences on top and bottom of the e-mails sent by Addemar enhance the deliverability and some are legally obliged by European legislature. For each of the standard sentences, a translation is foreseen in all languages available in Addemar. When starting a creation, you will indicate the language for these standard sentences. They are realized through a special type of ADDEMAR tag: type='addemar'. To make your template editable inside the platform we have created several tags, how they can be used are described here below. You will be creating a text field dialog when you want a simple line of text, such as a title or a date, to be updatable for each individual creation. The text area dialog permits to make editable more lines of text, such as a paragraph; without however giving possibility to change something to the layout of the text. Add the following tags around the text that you want to make editable <ADDEMAR type='textfield'> and </ADDEMAR>. You have defined that the Textfield dialog should open up when the words Title of content block 1 are clicked in the interactive preview. Give your textfield a name by adding name='TextfieldName'. The name you give to the textfield appears as title on the pop-up. The result in the interactive preview is the following. You will be creating a texteditor pop-up when you want to give the user of your template more freedom to insert text, change layout within a certain area, and add pictures and tables where he wants it. ADDEMAR contains three levels of text editors. They all work via the WYSIWYG principle and permit an advanced user to put in true code. 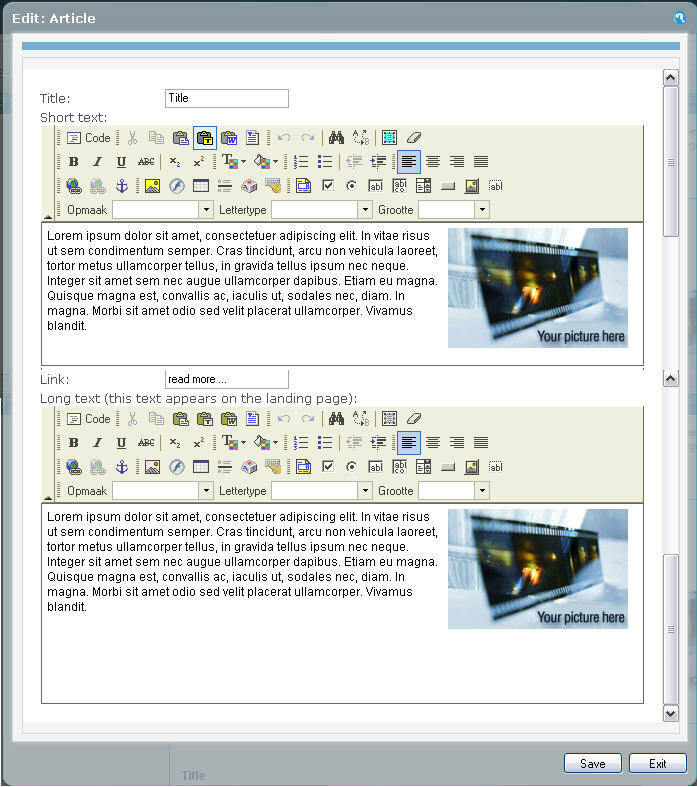 In this example we integrate the full version of the text editor. Localize the area in your original template. This can be an area included in a <div></div> tag, in a <td></td> or <tr></tr> tag, .... In this example, we will make the area withing the table cell <td> editable. Add the following tags around the area that you want to make editable <ADDEMAR type='texteditor_full'> and </ADDEMAR>. 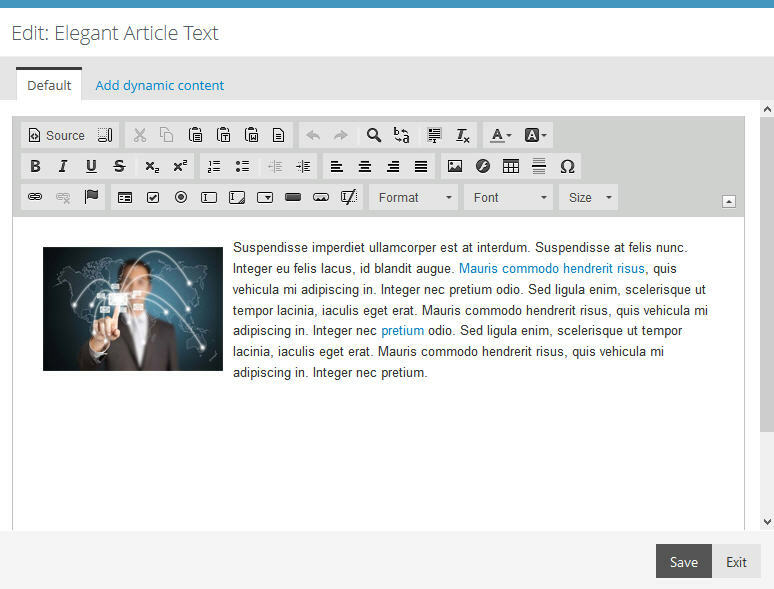 You have defined that the full texeditor dialog should open up when this paragraph with title and picture is clicked in the interactive preview. Give the area a name by adding name='AreaName'. The name you give to the area appears as title on the pop-up. Note: More information about the tools available in the texteditors can be found in the chapter about the interactive preview. Replace the <img by <ADDEMAR type='image'. You have defined that the Insert image dialog should open up when this image is clicked in the interactive preview. Give your image a name by adding name='ImageName'. The name you give to the image appears as title on the pop-up. 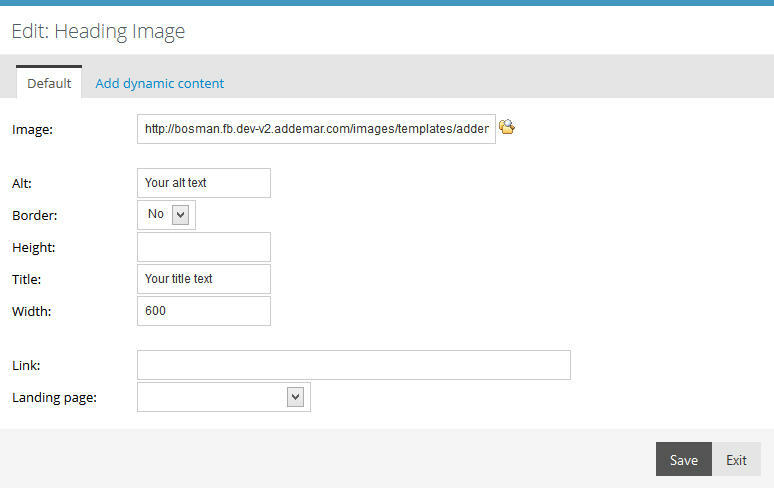 If you want the images to appear in your template, add the URL of the account library to the source. This URL is the following <?add_userdata?>/Image/. The other attributes (width, height, alt, border, ...) can be added, they will also appear in the pop-up. The values you give these other attributes will be editable. Note: File names should not use spaces, hypens (-) or other special characters. You have defined that the Insert link dialog should open up when the word More... is clicked in the interactive preview. Give your link a name by adding name='LinkName'. The name you give to the link appears as title on the pop-up. Take out the specific URL. If the URLs you use have a specific structure, you can put some indication on how to formulate the URL. If not, just put 'http://' so that the field will be prefilled with this necessary part of the URL. You can use the list tag when you want to give the user of your template the possibility to duplicate a certain area or a combination of areas. You define a list tag around another tag or group of tags, and this other tag or group of tags can be duplicated by the user. This will be nice, e.g. to add articles to a newsletter. Note: You can place the list tag around a <p> tag, a <li> tag, a <table> or a <div>. Do not use the list tag around a <td> or <tr>. Nesting of ADDEMAR tags is not a problem in this case, the ADDEMAR list tag may contain different other ADDEMAR tags. Localize the area that you want to make subject to duplication. This can be an area included in a <p></p> tag, in a <li></li> or <table></table> tag, .... In this example, we will make a list tag around an article contained in a <table>. Add the following tags around the area that should be duplicated: <ADDEMAR type='listitem' name='ListName'> and </ADDEMAR>. You have defined that this area including title, text and link should be duplicated when the list icon is clicked in the interactive preview. The news article is the special pop-up that is used in the basic template "Newsletter". This dialog is used to create at once, article per article, the content of e-mail and landing page. 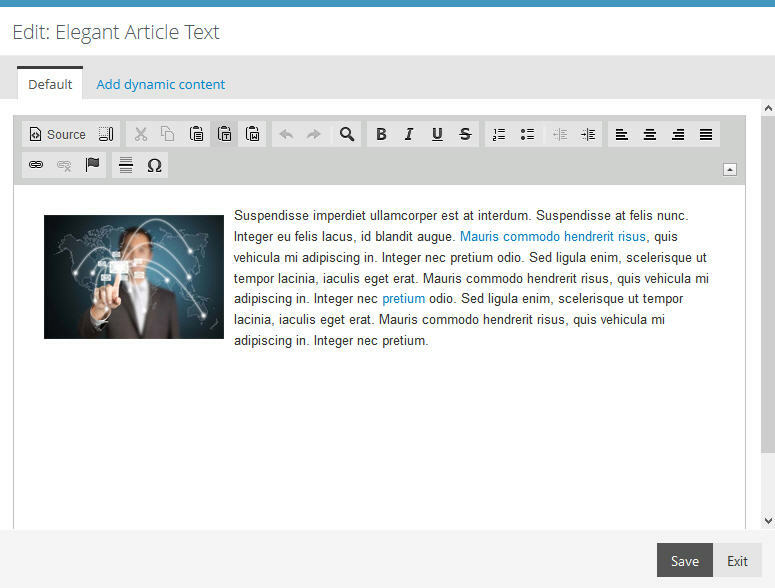 The user of your template will be able to specify for each article a title, a short and a long text, and a link to jump from the short text to the long text. On the e-mail, the title is shown followed by the short text and the link. When the recipient of the e-mail clicks the link, he will see an online version of the e-mail with the title and the long text. The name='' appears on the title bar of the pop-up. The text you define as value for title='' is the dummy text for the title of your news article. The user of your template will be able to edit this text. The text you define as value for link='' is the dummy text for the title of your news article. The user of your template will be able to edit this text. The text and/or images contained between the start and end tag is the dummy content of the short and long text. 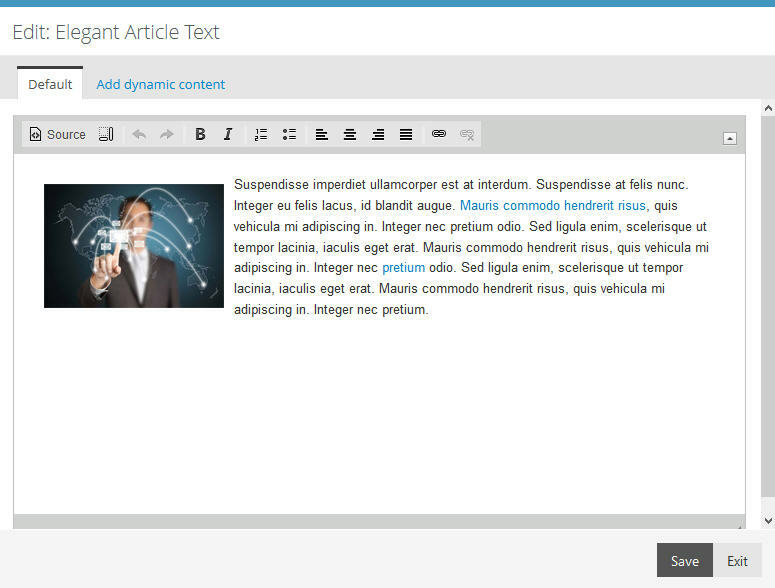 The user of your template will be able to edit both independently. Figure: example of a article tag in the interactive preview.